Sneaking into iTunes today while I wasn't looking, Street Fighter X Tekken Gauntlet pits Ryu and Kazuya against the entire mobile roster, 30 seconds at a time. 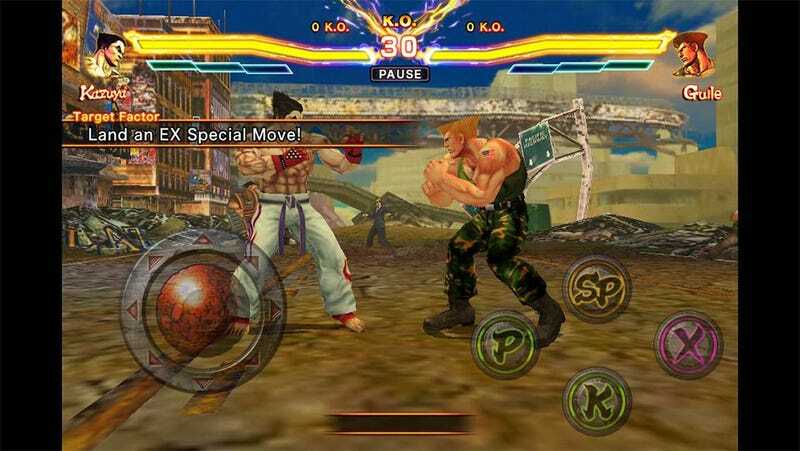 Built in the same engine as the full $.99 version of Street Fighter X Tekken Mobile (as evidenced by the lack of iPhone 5 widescreen support), Gauntlet is a "taste" of the mobile fighter. It's basically a 30 second survival mode, challenging players to take out as many opponents as possible while completing goals to replenish their vitality. This would be a nifty little game if there were any means of comparing your scores to other players. Instead it's just an odd little self-contained game, barely more than a demo. What an odd thing for Capcom to release. But hey, it's free! We like free, right?